Amazing. Life-changing. Inspirational. I can think of a lot of words, almost all of them clichés, to describe my year in Israel, but naturally none can even begin to sum it all up. How can you describe the pure joy of dancing at the Kotel on Yom Yerushalayim? The satisfaction of standing on the banks of the Kinneret after completing the Yam L’Yam hike? The ability to spend time with and get closer to my Israeli relatives? The amount of information I’ve learned about Judaism, Israel, and myself. 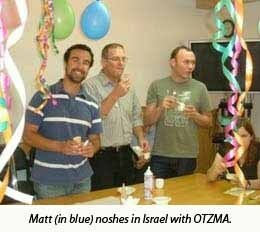 I have spent the past 10 months living in Israel as a participant on OTZMA, a post-college community service-based program sponsored by The Jewish Federations of North America, the Jewish Agency for Israel and MASA. OTZMA’s structure afforded me the opportunity to live in three different cities – Ashkelon, Haifa, and Jerusalem – and to learn what daily life is like in Israel in these very distinct places. While there are certainly plenty of cultural things I’ve had to adjust to (the Sunday-Thursday work week, the complete chaos that is a line at the supermarket), I have enjoyed each and every day I’ve had here. I love the energy and vibrancy of this country, as well as the amazing calm and tranquility that come every Friday, 18 minutes before sundown. I love that a couple of weeks ago, the driver of the Egged bus I was on stopped in the middle of the street to pick up a hand-delivery of freshly baked rugelach. I love how I’m constantly being challenged to think about what being Jewish means to me and to re-consider my level of observance. I love how despite going years since actively pursuing any kind of Torah or Tanach study, the things I’ve experienced and the Biblical connections to the places I’ve visited make it impossible for me not to re-engage in our wealth of religious sources. One of my favorite parts of OTZMA has been the education component, which has allowed us to learn about the wide range of domestic and foreign issues facing Israel and to meet with both government policymakers and NGO representatives. We’ve traveled all around the country, from Har Ben Tal in the Golan to Sussiya and the southern Hevron Hills to Yerucham and the Negev. We even had our own mock “Camp David 2010” conference to study in-depth the major final status issues surrounding the peace process. Each of these sessions, seminars, and trips has left me wanting to learn more, adding books and other resources to my “to read” list. While I’ve gotten into my fair share of debates and arguments about some of the major political issues, it’s only by being a part of a community that I’ve began to truly understand the real challenges facing Israelis in their day-to-day lives. In Haifa, for example, I helped teach a television production class to high school students with behavioral issues, and I was able to see how this kind of educational approach can spark these kids to turn their lives around. I also got to work with Ethiopian Israelis in both Ashkelon and Haifa and learned about the difficult balance between preserving Ethiopian culture and absorbing or assimilating into Israeli culture. It’s been fascinating to talk to all kinds of Israelis about life here. Whether religious or secular, Ashkenazi or Sephardi, third-generation or oleh chadash (new immigrant), Israelis care deeply about the future of their country, and as anyone who’s spent time here knows, they hold nothing back when it comes to their opinions of how best to move forward. And the great thing is there are people truly working to change and improve life here. During my two months as an intern at The Jewish Federations of North America’s Israel office, I’ve had the opportunity to see how American and Israeli philanthropy supports social change all over Israel. Just as it is in the United States, the gap between rich and poor in Israel has become a huge problem, and it’s critical to the country’s future that there are significant resources going to aid young adults find affordable housing, provide better after-school enrichment programs for youth-at-risk, and boost economic development in the Negev. As the campaign to de-legitimize Israel grows, it’s become increasingly important for Jews everywhere, and specifically young Jewish adults, to consider everything Israel has given to us and to the rest of the Jewish world in just over 62 years of existence. For the first time in literally thousands of years, the Jewish people have a country of our own, one where we can decide our own future and live freely as Jews. For generations upon generations, our ancestors prayed for the return to Jerusalem and to this land, and now that we have it, it’s our individual and collective responsibilities to ensure its success. A century ago, the original Zionist chalutzim came here and settled and built the land. They drained the swamps, developed an infrastructure and gained international recognition for the re-establishment of a Jewish state. The generation that followed paid a heavy price to defend the nascent state over years and decades of wars and also played a crucial role in developing and transforming the country’s economy. The challenge set forth to me and my generation is to figure out how we will continue their Zionist ideals and what we will do to ensure that Jewish life continues to flourish, not only in Israel, but in the Diaspora as well. Like many of my fellow OTZMAnikim, one of the reasons I came here was to figure out what to do with the rest of my life. After graduating from college and working for three years at what had been my dream job, I realized my real passion lies with the Jewish people and with Israel. This year has re-affirmed that feeling as well as my commitment to finding a career that helps me do my part to strengthen the Jewish community. I want to take this opportunity to thank the people and organizations who have made this experience possible for me: The Jewish Federations of North America, MASA, and Combined Jewish Philanthropies in Boston for their support of the OTZMA program as a whole and their financial contributions towards my personal participation. The OTZMA staff has worked tirelessly to provide us the best possible experience, coordinating some amazing education seminars and what I’m sure will be a memorable final tiyul. I also want to thank my fellow OTZMAnikim, without whom this year would have been a lot more difficult. We should all be proud of the amazing work we’ve done as individuals and as a group, and of the way we’ve become a family, celebrating holidays together and supporting each other through the hard times along the way. You’ve all challenged me, kept me smiling, and yes, provided me with tons of ice cream, and for our experience together this year, I feel truly blessed.